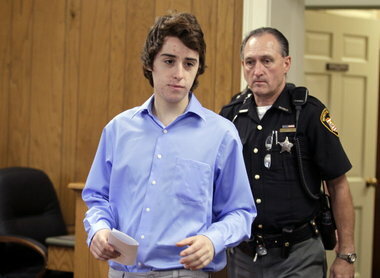 Earlier this year, Ohio teenager T.J. Lane shot five fellow students at Chardon High School, three of whom died. Now, Lane's defense attorneys are contending that he was insane at the time and should not be convicted. Lane entered a plea of not guilty by reason of insanity on Monday. Lane's attorney, Mark DeVan, contends that Lane has suffered from visual and auditory hallucinations and severe migraines for years. In Ohio, insanity pleas are uncommon and are rarely successful. Ohio Revised Code Section 2901.01(A)(14) provides that "A person is 'not guilty by reason of insanity' relative to a charge of an offense only if the person proves, in the manner specified in section 2901.05 of the Revised Code (i.e. by a preponderance of the evidence), that at the time of the commission of the offense, the person did not know, as a result of a severe mental disease or defect, the wrongfulness of the person's acts." Dr. Sara West, a Case Western University assistant professor of psychiatry, opined that the difficulty in asserting an insanity defense is proving that a severe mental illness caused the person to commit the offense. "A delusion would have to be specific and related to the crime that was committed," stated West. The attorneys of DiCaudo, Pitchford & Yoder have extensive experience handling criminal charges, including serious offenses such as murder. If you are facing criminal charges or have questions regarding Ohio's criminal law, contact the experienced Criminal Attorneys of DiCaudo, Pitchford & Yoder today.